Do you have a Letter of Determination, a Letter of Dissolution, or a Reinstatement Letter? If you are having trouble uploading your Letter of Determination, it may be larger than the allowed size of 10 MB. To resolve this issue you will need to compress the file. Below is a link to assist you. 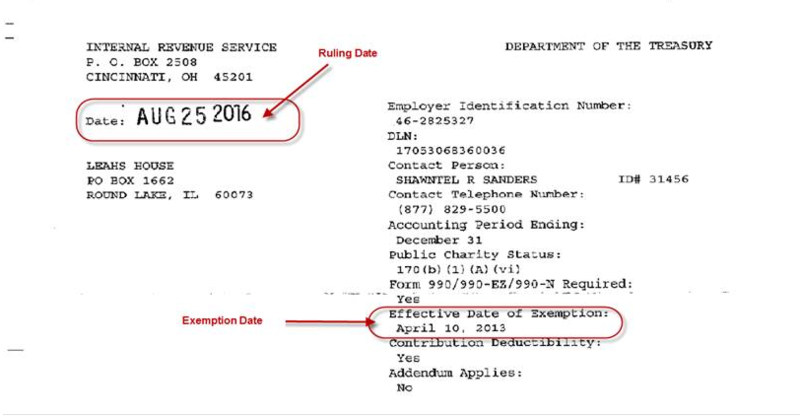 There are 2 dates on a Letter of Determination, the stamped date, which is the date the IRS gives the determination (or the ruling), and the “Effective Date of Exemption”, this is the date that the org is exempt from taxes and donations can be made that are tax deductible. See the example below. If you have concerns about these dates you will need to follow up with the IRS. You may contact the Nonprofit Division of the IRS for more information at: (877) 829-5500 (toll-free number).